The realm of Middle-earth has been yours to explore for years, taking your own Fellowships of heroes on adventures in The Lord of the Rings: The Card Game. 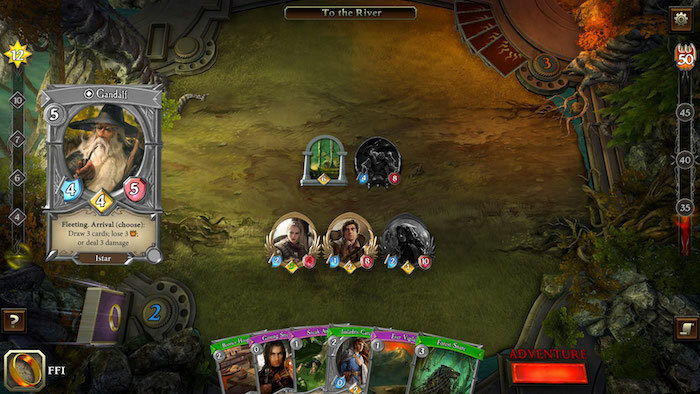 Now, this physical Living Card Game® crosses over into the digital realm with The Lord of the Rings: Living Card Game from Fantasy Flight Interactive—available now in early access through Steam! 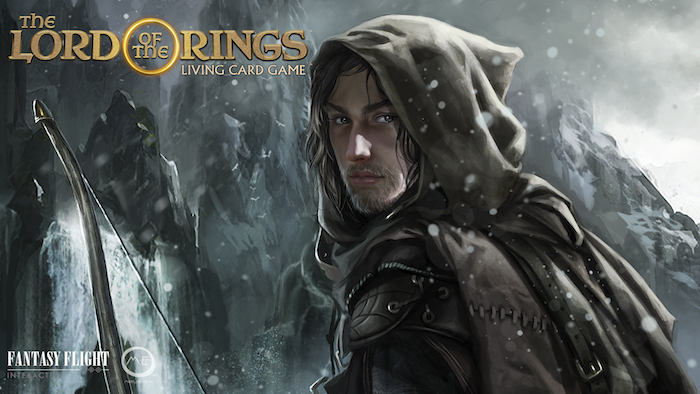 Over the past few weeks, we’ve looked at the different types of cards that you might use in your decks, but today, we sit down with Caleb Grace to answer some questions about The Lord of the Rings: Living Card Game! Fantasy Flight Games: You’re best known as the designer for The Lord of the Rings: The Card Game. What were your thoughts when you first heard about the upcoming digital version of the game? Caleb Grace: I was really excited to learn that FFG wanted to expand on the LCG by adapting it as a digital game. Out of all the games and IPs that FFG could have chosen for our first foray into the digital realm, they chose the game that I had been working on for five years at that point! I took that as a pretty big compliment, and a compliment to everyone who has contributed to the game, especially Nate French for coming up with the original design. FFG: What role did you play in the development of the digital game? CG: I was lead developer on the digital card game for a little over a year. Originally, I worked with the media and interactive team here at FFG. I helped them develop their proof-of-concept demo. Later on, when the project had grown and increased in scale, the Fantasy Flight Interactive studio was founded. From then on, I worked with Tim Gerritsen and his team, providing ongoing design and development work. Eventually, FFI was able to hire their own in-house developer, but I still have a great relationship with FFI and I occasionally get asked for my input. FFG: What are some of the largest differences between the digital game and the physical game? CG: The digital game is a much more streamlined experience than the tabletop game. The tabletop game arguably gives us more freedom to innovate because we are only limited by imagination, but players still have to interpret card effects and manage the encounter deck in addition to their player cards. In the digital game, everything but player choice is completely automated. The game manages setup, Sauron’s deck, enemy behavior, everything. That frees up a lot of player bandwidth and drastically reduces the bar of entry to the game, making it easier for anyone to enjoy. FFG: What new areas can you explore in the digital realm that may have been much harder to realize and implement in the physical game? CG: Customizing each encounter to respond to a player’s choices is something we can’t easily do in the tabletop game because it requires so many moving parts for the players to manage. 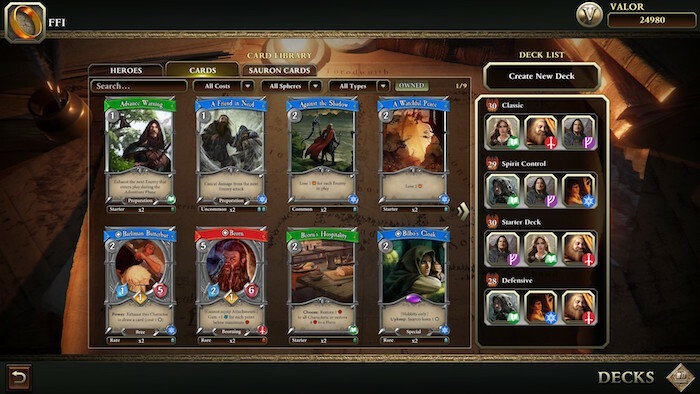 But in the digital game, it can all be done behind the scenes, creating a seamless experience where Sauron responds to the evolving board state and unique events occur in each adventure as a result. There’s a lot more room for surprises when the players can’t just pick up Sauron’s deck and look through its contents. FFG: What does deckbuilding look like the digital game? CG: Deckbuilding for the digital card game is one of my favorite features. Once again it draws inspiration from the tabletop, but streamlines it. Instead of requiring a resource match to pay for cards, as in the tabletop game, all of the sphere matching is done up front when you’re building a deck. For example, in order to include any leadership cards in my deck, I must choose at least one leadership hero. But if I want to include a level two leadership card, I must choose two leadership heroes. Once I start the game, however, I no longer require any resource matching to play the cards in my hand; I only need to spend the correct number of resources. FFG: Let’s talk about the Limited Collector’s Edition for a moment. What is your favorite piece included in this special edition of the game? CG: Well, obviously, my favorite part is the Two-Player Limited Edition Starter that I designed. It’s the perfect entrypoint into the tabletop game for anyone who’s even just a little bit interested. It comes with two pre-built, 50-card player decks, and two brand-new adventures. 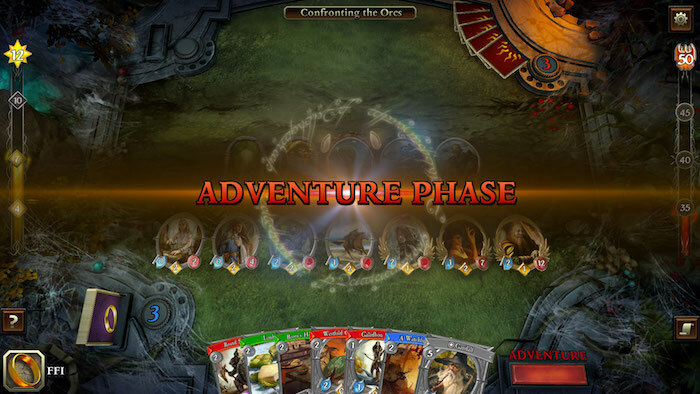 The first scenario was designed as a learn-to-play adventure, and the second one was designed to provide more of a challenge while simultaneously showing off a bit more of the unique things we can do in The Lord of the Rings: The Card Game. The player decks are simple enough so that a new player can just pick them up and play without any trouble, but they’re also strong enough that a player could bring them to their local game store and join other players in a cooperative game! FFG: What were some of the biggest challenges that you faced when working on the digital game? CG: Working on a digital game is very different from working on a tabletop game. When I design player cards and scenarios for the tabletop game, I can just throw ideas on paper and try them out. If the original language I use is a little confusing, I can clean it up as I go. But with a digital game, you have to program everything exactly as you want it to work. There isn’t any room for interpretation, so I had to learn to be much more specific with my language. FFG: Now that the game is in early access, do you have any big plans for the future? CG: Tim Gerritsen and I had a really exciting jam session where we brainstormed all kinds of ideas for the future of the digital game. From that conversation, we outlined the first four or five years of the game’s releases, and each year had something truly amazing to look forward to. I know that Tim and his team at FFI have big ambitions for the game and I’m personally excited to find out what they have in store for us. 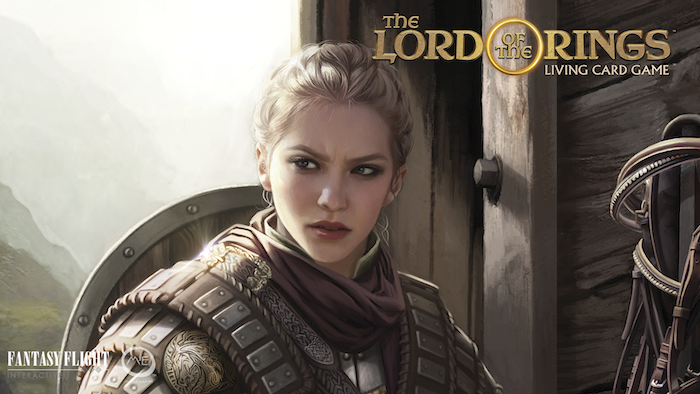 Whether you’re familiar with The Lord of the Rings: The Card Game, or the lands of Middle-earth are new to you, there’s plenty for you to uncover and explore in The Lord of the Rings: Living Card Game. Start playing The Lord of the Rings: Living Card Game today through early access on Steam, and pick up the deluxe Limited Collector’s Edition from the Fantasy Flight Games website while supplies last!